Monster Physics will have children building all types of objects in order to complete missions or just for the simple fun of it. Monster Physics is an educational game for children and adults. It has three activities: missions, building, and learning. In the learning section, children become familiar with common physics vocabulary terms. They can build any type of object they can imagine using some or all of the 68 included parts. This game is suitable for Key Stage 1 and 2 and also has elements for higher key stages. 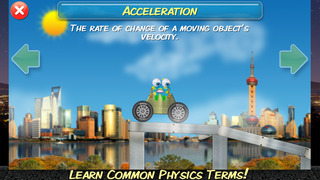 The app teaches students about the basic principles of physics such as friction, rotation, mass, speed and velocity. Monster Physics™ is a unique building app that lets you play with physics! 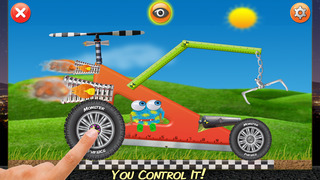 Build and operate your own car, crane, rocket ship, plane, helicopter, tank and more! Set your imagination free! Build intricate, working contraptions with over 68 different parts including wheels, rockets, propellers, cannons, magnets, claws, wings and more. Choose from different materials including metal, wood, plastic, rubber and ice. Connect parts together by welding them, drawing a rope or chain between them with your finger or using special dynamic joints to bring them to life. Once your invention is complete, Monster Physics™ will render it with it's built-in physics engine and let you actually operate your creation in real time. You can drive your car, operate your crane, guide your rocket into space or fly your helicopter! The possibilities are limited only by your imagination. Think outside the box! 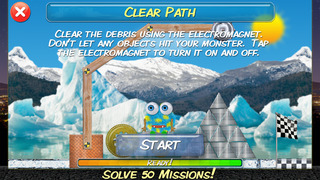 Monster Physics™ comes with 50 missions for you to solve including simple tutorials as well as mind-bending challenges. Many of the missions are open-ended and can be solved with a wide variety of different solutions so you can play them over and over again. Players will learn problem-solving and creative-thinking skills while having tons of fun. Have fun while learning! 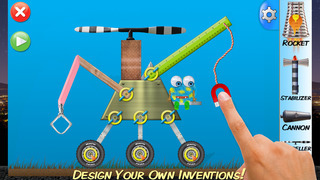 Players learn physics "hands on" through solving missions and building and refining their own inventions. In addition, a separate learn section introduces players to basic physics concepts such as friction, force, mass, acceleration and more.